Mount Malaya (Skt. malayagiri; Tib. རི་བོ་མ་ལ་ཡ་, riwo ma la ya, Wyl. ri bo ma la ya) or the Blazing Meteoritic Mount Malaya (Wyl. ri bo ma la ya gnam lcags 'bar ba) is the most important sacred place associated with Secret Mantra Vajrayana. It is the place where these teachings originated in our world when the Lord of Secrets taught them to the Five Excellent Ones of Sublime Nobility. It is also the place where the Buddha descended from heaven and taught the Descent to Lanka Sutra. 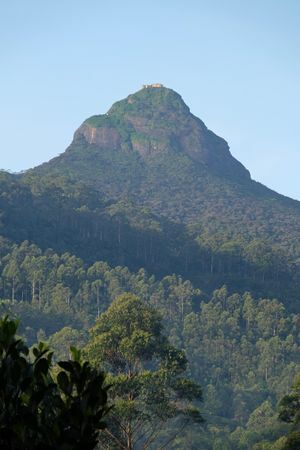 Situated in present day Sri Lanka, it is known as Adam's Peak or Shripada. ↑ The sutra begins: "Thus have I heard. The Blessed One once stayed in the Castle of Lanka which is situated on the peak of Mount Malaya on the great ocean, and which is adorned with flowers made of jewels of various kinds." See Online version of full text of the Sutra translated and introduced by D. T. Suzuki (710K). This page was last edited on 2 January 2018, at 04:33.